Welcome to #WhoWhatWearing, a series in which we highlight you, our stylish community of readers. Each of the following looks came straight from a photo you tagged us in on Instagram. Want to be featured next time? You guessed it: Use #WhoWhatWearing on the outfit posts you want us to see. No matter your style, I'd venture to guess there's one common denominator all our closets share: a great pair of jeans (or five). 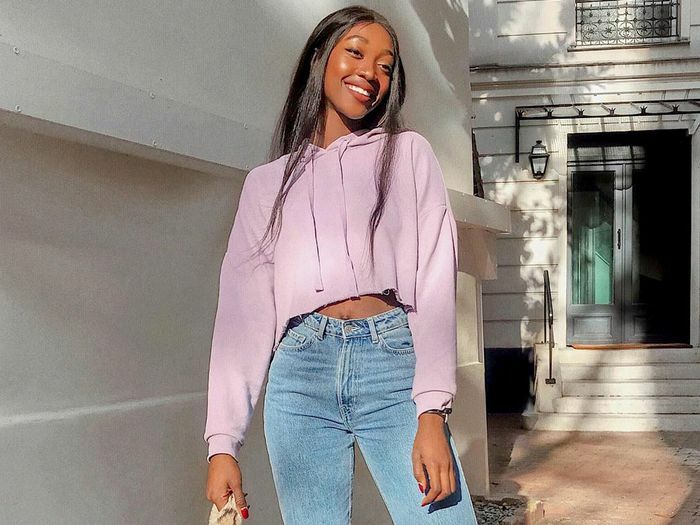 Whether you're intensely loyal to a certain jean shape or can frequently be found testing the waters with new denim styles, we insist you be informed upon the latest jean trends to hit the scene in 2019. Maybe it's because the New Year has us feeling full of opportunity, or maybe this new wave of trends is just really that good, but we're pretty excited about the following four trends. And clearly, so are you. We had an inkling the following styles would be relevant this year, but seeing how you've been styling them all over Instagram has us doubling down in full support. For those with classic style, it's all about simple updates to the shapes you've already known about, like straight-leg jeans with an elongated hem. On the trendier end of the spectrum, you'll find those new-on-the-scene trends everyone's just now buzzing about, like baggy "anti-skinny" jeans. Those are just a few of the denim trends we've spotted our stylish readers wearing these days on the 'gram. Keep reading to discover all four jean trends and get inspired by how they're worn. 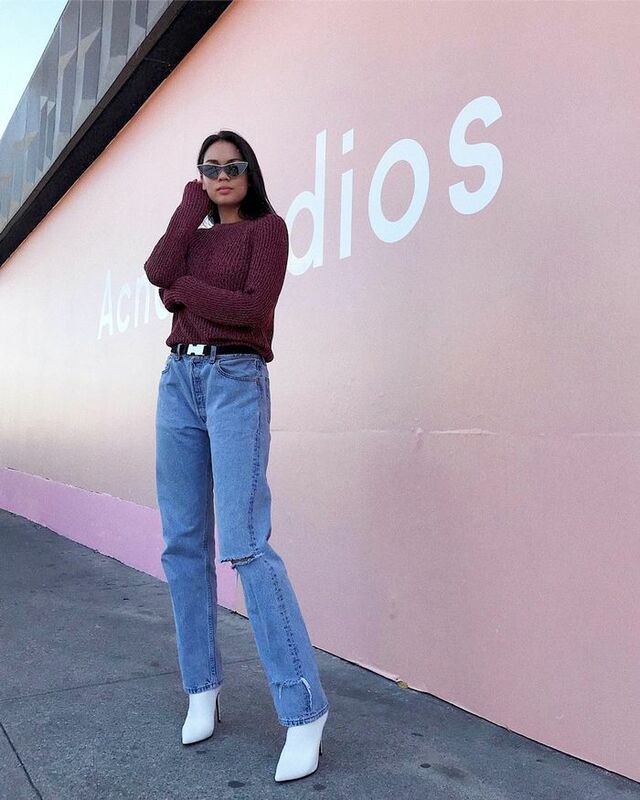 "Dad" jeans, anti-skinny jeans, baggy jeans—call them what you will, but the voluminous, loose-leg denim shape has arrived as the freshest jean trend of 2019. Intimidating as it may look, the style is actually much more wearable than it seems. Just take the following ways fashion girls are already wearing the trend, styled with pointed-toe heels and boots and cinched with a cool belt. Cinch up the waist of these looser jeans with a cool belt. Kitten heels offer a chic element to the jeans' casual look. Pair the jeans with your sleekest accessories to dress them up a bit. A cropped sweater is the perfect match. They actually look cooler when you let them pool around your ankles. Nineties babies, we're looking at you. The return of charcoal-wash jeans (not jet black but not quite gray, either) has us reminiscing over all things '90s fashion. In 2019, though, our readers are giving the jean trend a modern spin. Take a cue from the below outfits and wear the darker wash just as you would blue—in other words, with everything from a T-shirt and boots to a blazer and sneakers. Charcoal wash and a baggy fit? It doesn't get any more '90s than this. Add a romantic white top for the perfect summertime look. Or use the jeans as a base for your brightest colors. They play well with prints, too. In the end, simple outfits will never fail. Straight-leg jeans are hardly a novel shape, but up until now, styles with cropped hems were the ones that dominated. This year, the classic cut gets a new spin with longer, ankle-grazing hems that instantly elongate the look of your legs. We love how the long hem looks with ankle boots peeking out underneath, or the look of their higher rise married with a cropped jacket. Whatever you choose, this is a staple jean style you really can't go wrong with. It's like they were made with Western-style ankle boots in mind. Sneakers go well with them, too. They go so well with other wardrobe classics. No need to run off to the tailor—the key to this fit is all in the length. The higher rise is just what your cropped jackets and sweaters were looking for. What used to be a necessary styling trick for those with shorter figures to avoid a trip to the tailor has turned into a micro-trend in and of itself. Cuffed jeans—especially those with an exaggerated 2- to 3-inch cuff—lend a fresh appeal to any jeans. Plus, they just so happen to frame your shoes perfectly. Clean and crisp, cuffed jeans offer a bit more structure to the look. Easily swap in a cuffed pair for any of your other go-tos. The bigger the cuff, the bigger the impact. Create a major shoe moment by cuffing your hem a few inches. Next: how our cool readers are styling their jeans this winter.